Horses have played a crucial role in human societies – as food, as a means of transport, in wars and as pets. The evolution of the horse’s appearance from a small animal the size of a dog to today’s big stallions has been studied by numerous scientists across the world. But so far, no-one has studied how the horse’s DNA has evolved concurrently with its appearance. That’s about to change now, as a research group at Copenhagen University’s Centre for GeoGenetics has embarked on a study of the evolution of the horse’s DNA. It is hoped that the study will provide new insight into how changes in the environment and the presence of humans, along with the subsequent domestication of the horse, have changed an animal species all the way into the DNA. “The different breeds of horses can be regarded as experiments carried by us humans, and those experiments have resulted in a wide variety of horses. This project will enable us to see which genes are changed in each individual experiment. We will be able to explain the processes – man-made and those caused by the environment – that biologically drive the evolution of a horse’s appearance,” says Associate Professor Ludovic Orlando, who heads the project. When the researcher says that horses can be regarded as experiments carried out by humans, he means that by selecting certain individuals and giving them benefits, for instance food or by direct breeding, we select for certain traits, e.g. size, strength or temper. Most of the existing horse breeds are bred by humans, which is why it is not possible to see from their DNA what the DNA of the primordial horse looked like. 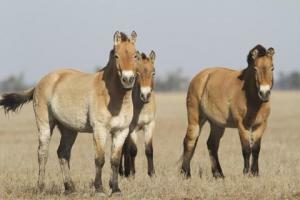 If the researchers succeed in sequencing the genome for the primordial horse, they will compare it with the genome for modern horse breeds and the genome for the so-called Przewalski’s horse, which is believed to be the only remaining truly wild horse (Equus ferus) in the world and may be the closest living wild relative of the domesticated horse. Przewalski’s horse is a rare and endangered subspecies of wild horse native to the steppes of central Asia, specifically Mongolia. The researchers have so far characterised the complete genomes of a number of living horse breeds, which will be used in the comparison. Orlando and his colleagues are using state-of-the-art ancient DNA (aDNA) methods together with second and third generation sequencing technologies in their study. They have collected DNA from horses spanning thousands of years. They are reluctant to go into further details about this as some results are currently under consideration for publication in a high-profile scientific journal, which means that certain details must be kept confidential until the article is published. “I can, however, reveal that we’re going back to long before horses became domesticated some 5,500 years ago. We’re studying DNA that’s older than what has previously been studied in this context,” says the researcher. The project is expected to last about three years.